Feline chin acne is a common skin condition in cats. It can appear at any age and in either gender. It may wax and wane or be stubbornly hard to treat. Signs range from barely noticeable comedones (blackheads) to severely inflamed and draining pustules. Some cats are not bothered, while others find the acne very itchy and painful. Local hair loss and redness are also common. What Is Feline Chin Acne? Just like in humans, acne forms when the hair follicles around a cat's oil-producing sebaceous glands become clogged. Chin acne is the most common occurence in cats, even though they also have sebaceous glands on their tails and eyelids. While it's common in all breeds of cat, for some reason Persian cats seem most susceptible to recurring cases of chin acne. Many cats first present with a "dirty" chin. This could look like small black dots in between the hair follicles. That may be all that develops for some cats. For others, this can progress to swollen, red lumps that may or may not rupture and drain. If it progresses, and the follicles become infected with Staphylococcus aureus, the acne may turn into bacterial folliculitis. This is a more serious skin infection that will likely need more aggressive treatment. Folliculitis also can lead to secondary fungal infections if not treated properly. Plastic food bowls were once considered a possible culprit for causing feline acne (allergic or contact sensitivity), but it is now thought that the bacterial levels found on plastic dishes may be the real problem. Using glass, metal, or ceramic dishes will help. It's also important to frequently wash the dishes. You also may consider raising your cat's food and water bowls, so that the fur on its chin doesn't come into contact with whatever's in the dish. And just like in humans, cats can develop acne due to allergies. Vary your cat's food and treats to make sure there isn't an ingredient in them that's causing an allergic reaction. You'd likely notice other allergic symptoms if this were the case, but not always. Many times the diagnosis is by your vet's examination. Your vet will want to rule out other possibilities, such as mites, fungal and bacterial infections (primary or secondary) or fleas and assess the cat's general overall health. Testing methods include fungal and bacterial cultures and skin scrapings. In severe cases, where the skin is red and sore, a biopsy may be performed. This condition can mimic other more serious conditions that should be ruled out, including ringworm, skin mites, or even a fungal yeast infection. These all should be ruled out before any kind of treatment begins. Chin acne is usually "managed" rather than cured. 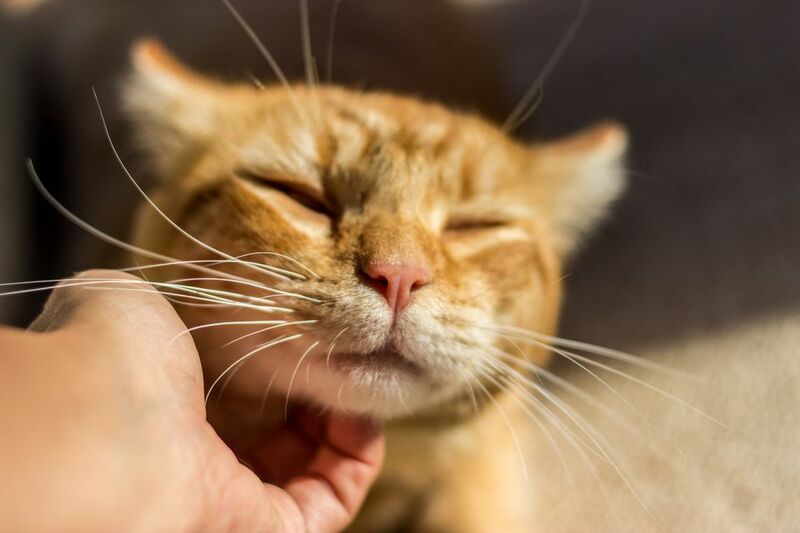 Home treatments include gentle washing of the chin once or twice daily with a mild soap, benzoyl peroxide, chlorhexidine, or other cleanser recommended by your veterinarian. For pustules, warm water compresses or tea bag compresses will help soothe and heal the acne. Use metal, glass, or ceramic food and water dishes. Wash those dishes daily. If you suspect that your cat has chin acne, see your veterinarian at the first signs noted. This will reduce or prevent secondary infections and make treatment easier. It will also reduce any trauma-related infections from the cat scratching at the chin for the itchy and painful cases. Never use human products or medications on your cat without first checking with your veterinarian. Some products may be fatal for your pet. What Can I Do to Prevent Bezoars in Pets? Why Does Your Cat Fart So Much and What Can You Do About It? What Is Involved in a Cat Declaw Surgery? Is Your Cat Pregnant? Here Are Some Major Signs to Look For!